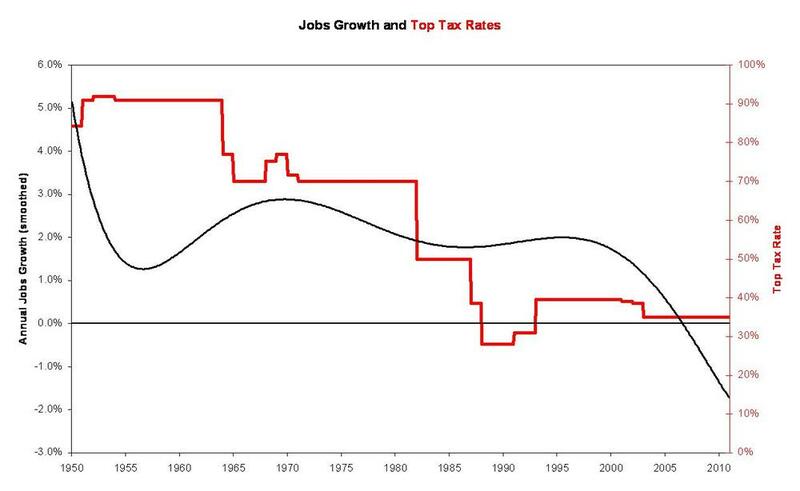 Diminishing return: lower taxes result in lower job growth in the long run — note the nosedive after the Bush tax cuts in 2000. Uh oh: the larger the high-end tax cuts, the larger the deficit — note the explosive growth of the deficit after the Bush tax cuts of 2000 (red line). 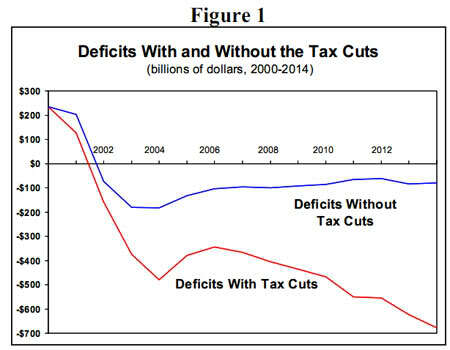 Note also that if the Bush tax cuts were repealed, the deficit drifts easily into manageable territory (blue line). If we’re talking bottom line, here it is: lower taxes have demonstrably meant diminishing job creation (not to mention devastated social services) and larger deficits. We know that’s not been the conventional wisdom since the storied days of Ronald Reagan in the misty past of thirty years ago, but it is the reality. Even after eight years of Bushonomics that have crippled American fiscal policy, the current government of Canada is about to more or less repeat the same mistakes. Social and government services will be cut in the name of “austerity.” Welfare, meanwhile, is now strictly for corporations in the form of still more tax cuts, the purchase of tens of billions worth of American jet interceptors, and a massive payday for developers with the building of new prisons at a time when crime rates are down sharply after declining for a decade. This entry was posted in Current Events on May 30, 2011 by Michael Happy. The traditional view of the Bible, as we all know, has been that it must be regarded as “literally” true. This view of “literal” meaning assumes that the Bible is a transparent medium of words conveying a “true” picture of historical events and conceptual doctrines. It is a vehicle of “revelation,” and revelation means that something objective, behind the words, is being conveyed directly to the reader. It is also an “inspired” book, and inspiration means that its authors were, so to speak, holy tape-recorders, writing at the dictation of an external spiritual power. We have next to try to understand how this view arose. In a primitive society (whatever we mean by primitive), there is a largely undifferentiated body of verbal material, held together by the sense of its importance to that society. This material tells the society what the society needs to know about its history, religion, class structure, and law. As society becomes more complex, these elements become more distinct and autonomous. Legend and saga develop into history; stories, sacred or secular, develop into literature; a mixture of practical knowledge and magic develops into science. Society struggles to contain these elements within its overriding concerns, and tries to impose on them a structure of authority that will keep them unified, as Christianity did in medieval times. About two generations ago there was a fashion for crying up the Middle Ages as a golden age in which all aspects of culture were unified by common sentiments and beliefs. Similar developments, with a similar appeal, are taking place today in Marxist countries. This entry was posted in Politics, Religion on May 30, 2011 by Michael Happy.